This pack contains a photocopiable Student's Guide and a Teacher's Commentary. In the Student's Guide the film is segmented into 10 units of 7-12 minutes duration. This facilitates work in the normal class period. There is a series of questions for each sequence that guides the viewing of the students and encourage them to keep a personal Response Journal. The Teacher's Commentary is a well researched separate booklet which covers issues raised in the guide. Each pack is priced @ € 40.00, postage free. Titles are shipped on receipt of payment. Delivery is by Standard Post: next-day delivery in Ireland, and 2-10 days for international orders. There is a cut to a medium shot of the figure, Juno, and then another to a close-up of her as she gazes at the armchair. The voiceover that will come in at several points later tells the audience “It started with a chair.” A cut to a very low angle shot of a figure removing underwear follows. In the background a male figure sits naked and passive in an armchair like the one on the lawn. The camera follows the person in the foreground and a reverse shot lets the audience know that Juno is the protagonist. A female voice sings a plaintive love song (Once I Loved), the first of many songs that will be included in the soundtrack. Some of them will be obviously diegetic and others non-diegetic. The tenderness and intimacy of the scene are added to by the subdued lighting and warm colour scheme. This effect is increased by the editing. Big close-up shots of the couple bring the audience into the action and position them to empathise with the young lovers. The boy, Paulie, tells Juno how he has wanted this to happen for a really long time. Juno lets him know that she is aware of this. He expresses his joy eccentrically by declaring “Wizard!” Juno seems to be breaking stereotypes by being the one who initiates this ‘seduction’. The shrill barking of a dog and the abrupt ending of the music mark the transition to the next shot. It seems to explain why Juno has been standing staring at the chair: the previous scene was a flashback. Juno is mad at the dog. It has broken the reverie that was brought on by the sight of the armchair, presumably. The living room set, left out for binmen to take away, is presented to us at an oblique angle. The light of the sun brings out the various shades of gold, amber, russet and brown and matches the colour scheme of the love scene. Juno is dressed in similar colours. The use of an oblique camera angle is usually code in cinematic discourse for something being slightly off kilter, for something in the action being not quite right. Juno takes a big swig from the prop she is carrying, an oversized container of orange juice. A quirky love song (All I Want Is You by Barry Louis Polisar) begins on the soundtrack a beat ahead of the cut to Juno walking away. Fallen leaves lie on the lawns she passes. A group of runners dressed uniformly in the colours that have predominated in these opening scenes passes. Their tops are russet, their shorts saffron, their socks white with saffron and russet stripes. Juno seems oblivious to them. There is a break before the harmonica part of the song and it cleverly matches the change that comes over the image as Juno seems to walk into an animated world. (This clever matching of the soundtrack music and visual image is a major feature of the narrative style of this film.) There are about two dozen shots as Juno walks on. She is presented to us in medium shot as Ellen Page’s name appears in the credits. Juno’s facial expression seems to suggest that she is happy and carefree, as a young person should be. The music is jaunty and the chorus is: All I want is you, will you be my bride / Take me by the hand and stand by my side / All I want is you, will you stay with me? / Hold me in your arms and sway me like the sea. After the intimacy of the love scene, the cartoon effect seems to suggest that Juno is floating along, in a dream world almost, flying on the wings of her love. In the light of what we have seen so far, we might even conclude that she is in love. Leaves lie underfoot and birds fly across the sky. Many shots reflect the lyrics of the song. Juno passes a beauty treatment shop with the letters “izard nails” on its shopfront frieze. This might remind the audience of Paulie’s exclamation in the love scene and could be taken as an indication that this stylised world is a projection of Juno’s thoughts and memories. Juno continues to drink from the oversized container. The runners pass her again. The animation ends when Juno reaches a drugstore. She throws the empty container into a trash bin and enters the shop. When we cut to the interior shot a bell rings, as if signalling the fact that Juno is moving from a dream state into reality; harsh reality, as we soon find out. Juno is in a different world from the one she occupied in the previous scenes. The shop assistant, Rollo, refers to Juno as “MacGuff the crime dog” (a pun on the 1980s puppet McGruff the Crime Dog) and asks if she is back for another test. As he teases her, he fails to notice that his other customer is pilfering from the cosmetics stand. The next shot provides the type of test to which he is referring: pregnancy test. Juno does not trust the result she has already got. Rollo tells her she is definitely pregnant. He is holding back the key to the restroom as he tells her this. She refers to him as an old man and tells him she has drunk her weight in orange juice, presumably to facilitate her urine test and get a more scientific indication than the one suggested by the pilfering customer. Rollo relents and hands over the key telling Juno she can pay for the test kit when she returns. The music starts up as the next scene begins. We are presented with an extremely low angle shot of the interior of the restroom. The last time we saw such an angle was in the love scene. The director is linking the two scenes by repeating the camerawork. The colour scheme reinforces this as Juno takes the test. She then re-emerges into the shop and takes a length of liquorice rope from its stand as she waits for the result. The camerawork presents her in big close-up as it appears. The music stops, adding finality to the reading. Juno seems to accept the positive sign with stoicism but then gives the stick a good shake to see what happens. Rollo, in his brash smart-alec language, tells her it is not possible to change the sign. (The reference to Etch-a-Sketch is another of the many references to contemporary American popular culture that pepper the dialogue.) The pumpkin on the counter, a reminder of Halloween, is another indicator of the season. The music starts up again and Juno leaves the drugstore carrying two props, her liquorice rope and her pregnancy test stick. They might be read as metaphors for the plight she finds herself in: a girl with a woman’s condition. She looks worried as she pauses in the doorway and discards the test stick. The group of runners divide to let her pass through them. The day has grown dark now. Gloom has descended. It may be read as a metaphor for the way Juno is feeling about being pregnant. She has made a noose with the liquorice rope and throws it over a branch of a tree. She does not like the feel of it constricting her throat so she takes a bite out of it! If suicide is a solution to her problem, she is not interested in it. This may be the blackest touch of comedy in a film that is full of various kinds of humour. The camera pans across a shelf in Juno’s room that ironically has four baby dolls standing on it. (The book behind is a Spanish play with the first name of the screenwriter, Diablo Cody, on it, another of the playful cultural references in the film.) There is also a photograph of Paulie and Juno playing guitars. Another image on the wall shows a bare female figure. A small big-eyed balloon tied with a trailing string seems to be about to enter the shark-toothed, heart-shaped opening in its chest. This could be read as an ironic commentary on Juno’s condition. (Irony, which will feature in a big way in this film, has to do with appearance and reality in language and/or action. What a character says may not be what s/he means. A plot might take an ironic twist and surprise us. We might know more about a situation than characters involved in the action - this is known as dramatic irony.) Juno’s phone is in the shape of a hamburger. It is a prop that reflects the fact that she is still a young girl and so comments ironically on her condition. The music, which has unified the last three scenes as Juno has tried to come to terms with her girl/woman dilemma, stops when her friend, Leah, answers her call. Juno refers to herself as a suicide risk. We have seen that this thought has crossed her mind, however playfully it was presented to us. (Her reference to Morgan Freeman is another reference to popular culture: Morgan Freeman is a well known Hollywood actor. The star of the film she seems to be referring to, though, The Bone Collector, was Denzel Washington. Juno is sassy and quick but she is not always right.) Leah’s room is brighter than Juno’s and may be more expensively decorated. She has her walls covered in pictures just as Juno has. There are images of men that the audience might recognise: Glen Campbell, Prince Charles, Woody Allen, Burt Reynolds and, hilariously, Bill Clinton in a November’s Man poster! The name Dancing Elk (the town in Minnesota in which the action is set) can be seen on a flag on her bedstead. It has the same colour scheme as the socks and uniform of the runners at the start of the film. There is a cut to a medium shot of Juno as she tells Leah she is pregnant by Paulie Bleeker. Leah shows how vapid she is by asking how Juno could have enough urine for three pregnancy tests! She exasperates Juno. When the reality of Juno’s condition sinks in, Leah responds in the manner that Juno finds acceptable. Her first reaction is to talk about abortion. She has already helped another of her friends in a similar situation. Juno declines her offer but says there is something of critical importance she needs help with. The armchair has been used by the director to bracket the action of this opening sequence: it has appeared at the opening and the closing of the sequence. What is the first thing we hear on the soundtrack in this film? Where is Juno as the narrative begins? Describe the lighting. What seems to happen to the caption? What is Juno doing here? How does the voice-over begin? How is the camera being used in this scene? What might Juno mean by “It”? How does the musical soundtrack add to this scene? Describe the camerawork. What kind of lighting is used here? How is the atmosphere built up by the director? How does the boy, Paulie Bleeker, describe his feelings? Describe the transition to the next scene. How does Juno feel about the dog, do you think? How do you think she feels about what was going on in the previous scene? What has made her think about this? What is she looking at? Describe the colour scheme for the shot of the living room set. How is it presented to us? What is Juno drinking? Describe the transition to this next scene. How does the setting fit in with the opening caption as Juno walks away? Can you make out the group that passes her? How are the individuals in that group dressed? Describe the colour scheme. What do you think of the title sequence that follows? How does the animation fit with the previous scenes? What do you make of the song that plays over this sequence? How might it reflect the way Juno is feeling? What has the shop assistant, Rollo, to say when Juno enters the drugstore? What test is he referring to? How does Juno answer him? What is written on the miniature hockey stick he refuses to give her? What has he to say to her? 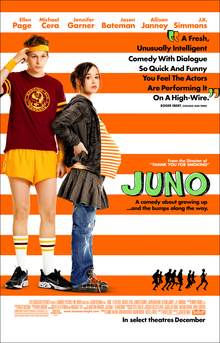 Why does Juno have to “Go pronto”? Describe the camerawork for the restroom scene. When was this technique used last? Why would a director use repetition in this way? What question has Rollo when Juno returns from the restroom? How are we positioned to view her as she reads the result of her test? What has Rollo to say about it? What kind of a person is he, in your opinion? Freeze the frame as Juno walks out the door of the shop. What is she carrying? Can you suggest a metaphorical reading for these props? Describe Juno’s facial expression as she discards the stick. How do you think she is feeling? Do you recognise the group that passes her as she walks along the sidewalk? Describe the lighting in these scenes. Might it reflect on how Juno is feeling? What does Juno do with the rope? Is she serious? What is happening here? Can you see any irony in the figures that Juno has on the shelf in her room? Do you recognise any of the people in the photograph as the camera pans to the left? Describe Juno’s phone. What do you think of the way her room is decorated? What might it tell us about her? What do you make of the drawing of the female figure with the heart pattern on her chest? When does the music stop? How has it been used over the previous three scenes? How does Juno introduce herself to her friend, Leah? Is she serious? How does Leah’s room compare with Juno’s? As the scene goes on see if you can spot any recurring feature in the pictures on her wall. How does Leah respond to Juno’s news? What does she think of Juno taking three pregnancy tests? What topic does Leah bring up once Juno’s news sinks in? How does Juno describe what she needs Leah’s help for? Describe the transition to the next scene. What does Leah think of Juno lifting the armchair? What has Leah to say about Juno getting pregnant? How does Juno describe what she did with Paulie? When did she decide on this? What is the irony in the song that plays over the inserted shot? Can you make out what Paulie has passed back to Juno? What do you think of her reaction? What do you think of the conclusion Leah comes to? How does Juno react to this? How does she describe being with Paulie? What conclusion could the audience draw from these last two reactions? What prop has unified the action up to this point in the narrative?